Country Club, Motion and 84 years-young Louis Macintosh. 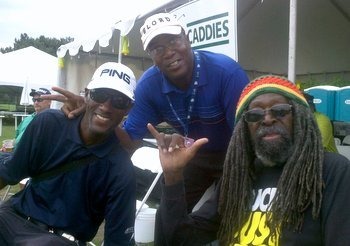 The caddie tent in Portland is a happin’ place. Photo courtesy of Steve Shellard’s Facebook post. This entry was posted on Wednesday, August 28th, 2013 at 8:39 pm and is filed under Uncategorized. You can follow any responses to this entry through the RSS 2.0 feed. You can leave a response, or trackback from your own site. Allison hanna -5,wow…minus 2 or 3 cut…guess this course is too short now for these grils..